Reconstruct the hairpin curve on US 42 from milepoint 6.1 to 7.1 to reduce the number and severity of crashes. By correcting the geometrics of the curve, safety will improve along KY 20 for both vehicular and truck traffic. Steep grades within the project area will require a large amount of cut and fill. This added expense has been included in the cost estimate. Additional right-of-way will be required to construct the curve in accordance with Kentucky Transportation Cabinet standards. 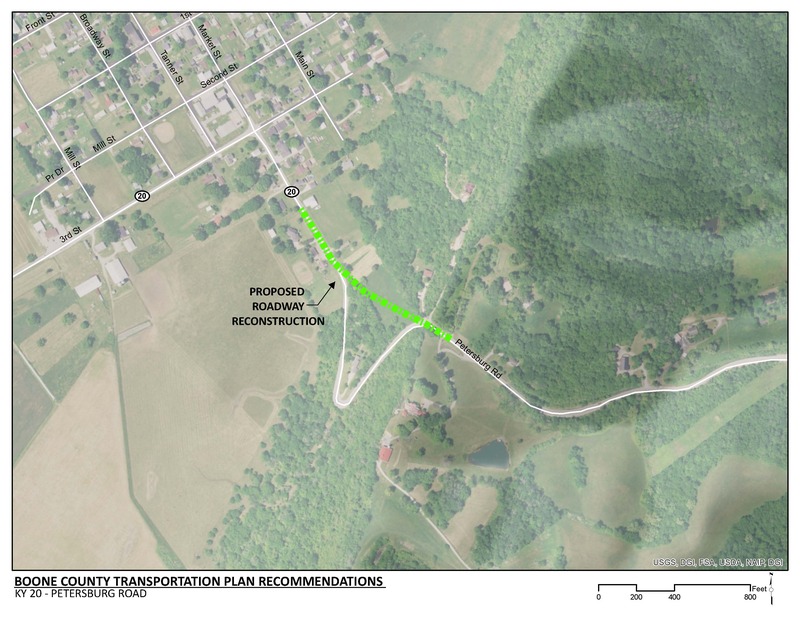 In the project area, KY 20 is a rural roadway that serves Petersburg and western Boone County. KY 20 is a primary truck route for quarries in western Boone County. The crash rate of KY 20 within the project area is 60% higher than the statewide average crash rate on similar roadways. Stakeholder comments noted that crashes involving trucks in this curve often shut down the roadway. The curve is not compliant with current radius or superelevation standards as presented in the “Policy on Geometric Design of Highways and Streets” by the American Association of State Highway Officials. These geometric deficiencies are a contributing factor to crashes within the project area.